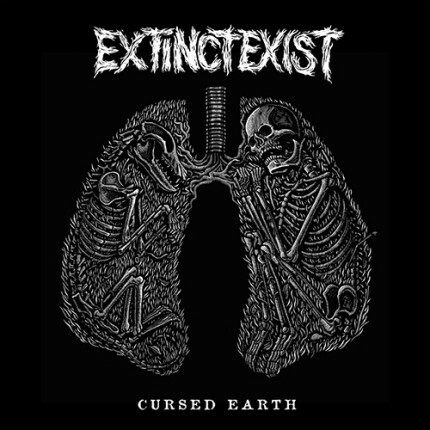 Related links to "Extinct Exist - Cursed Earth LP"
This is brute and heavy bulldozer crust from Melbourne, Australia going berserk on this 6 tracks. Extinct Exist features members of SCHIFOSI, NUCLEAR DEATH TERROR, PISSCHRIST and ABC WEAPONS at work and you might get a hint where this journey will take you. This is no blunt D-Beat , but rather the old "Peaceville , Metal , Punk" school just like "The sound of at blood encrusted war- machine running rampant in your living room". Recorded at Goatsound by Jason Fuller - Dec 2013 Mixed by Heng Shen Yeap April 2014 - Dec 2014 Mastered at Enormous Door by Jack Control - Dec 2014 Artwork by Santiago Mazatl. Includes a 8" x 8" - 16 page Booklet with lyrics, artwork and explanations.